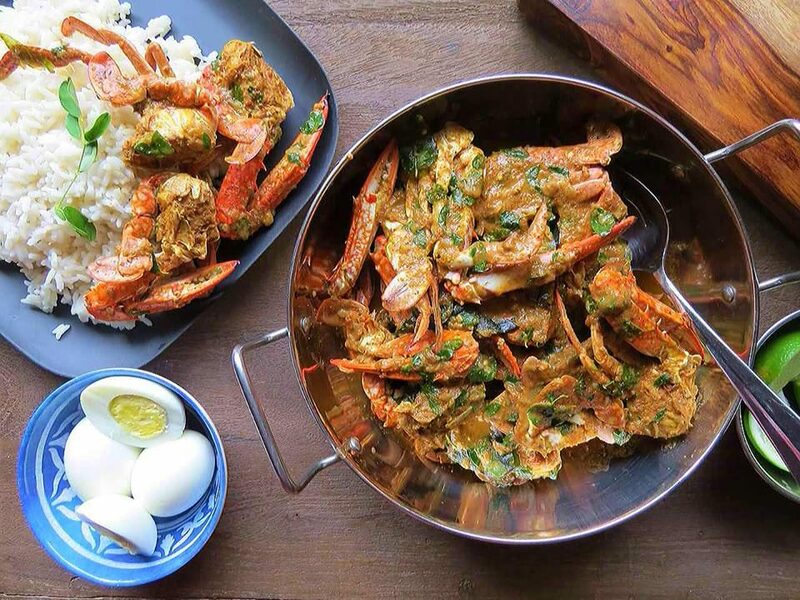 Crab curry is definitely a famous Sri-Lankan dish that is high in spice and flavour. This dish normally takes a bit of preparation time as traditionally it is made with fresh crabs. 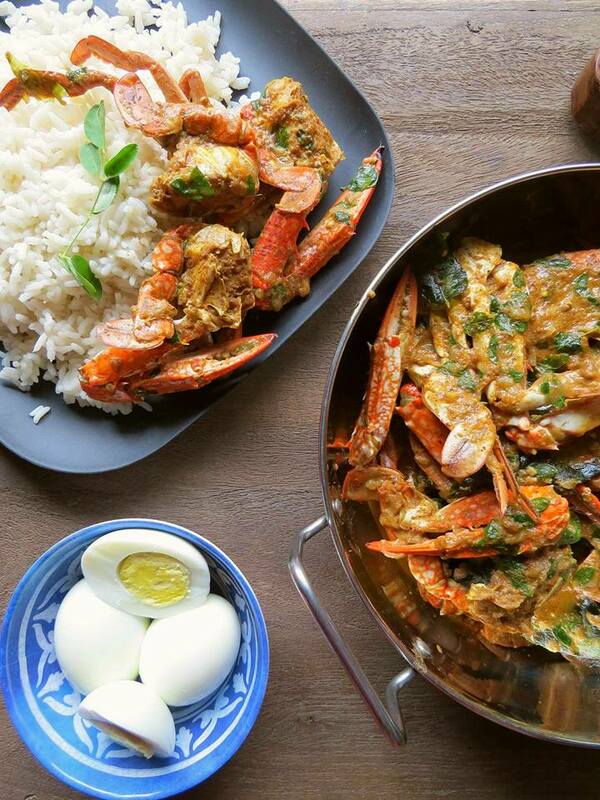 Since my husband loves crab curry I knew I had to learn to make this dish but did not want to buy live crabs and kill and clean them myself. My husband was not too keen on the idea either so I settled on buying frozen, already cleaned crabs available at Sri-Lankan grocery stores and was very pleased with the results. I usually leave the frozen box of crab in a large pot to thaw overnight. The next day it is ready to cook and the curry comes together pretty quickly as crab takes far less time than other meats to cook. We usually eat seafood for lunch on Sundays because Sundays are a race to get as many chores done as possible — seafood takes much less time to prepare, in my opinion. Sunday lunches usually consist of fish, crab, or shrimp curry, sometimes all of them depending on what I have time for. I use a crab masala powder which I roast and grind the night before. I highly recommend making the masala powder because it greatly enhances as well as complements the flavours of the otherwise simple but nonetheless delicious crab curry dish. I make my masala powder as per needed basis just because I love the freshness but for convenience it can be ground in larger batches. My crab curry is a relatively dry curry by which I mean it doesn’t have tons of gravy. This is just a personal preference as I find that the dry curry is far more flavoursome. If you prefer more gravy, simply add a bit more liquid. To make the masala powder, first roast all the spices on a dry pan on low heat. Stir often taking care not to burn the spices. When the spices start to turn aromatic and a shade darker, turn off the stove. Let the spices cool completely before grinding into a fine powder. Keep aside if using immediately; otherwise store in an airtight container to seal in the freshness. Wash the crab in cold running water and set aside. In a large, heavy bottomed pot, heat the oil on medium-high heat. Sauté the onions until soft and translucent. Add the garlic, ginger, curry leaves, and green chilies and sauté for a minute longer. Add the crab, water, roasted curry powder, and salt. Combine well and cover the pot. Once the crab turns a bright orange, it is cooked. This will usually take about 15 minutes. Add the milk, moringa leaves, and crab masala powder. Mix thoroughly and cover. Bring everything to a boil and cook on medium heat for about 10 minutes or longer if need be. The moringa leaves should be wilted and the gravy should be rich and dark. Stir often to make sure the crab meat soaks in the flavours of the gravy. Turn off the stove and add the lime juice. Mix well and adjust salt if necessary. Crab curry is a very flavourful dish and so it pairs well with plain white or brown rice. 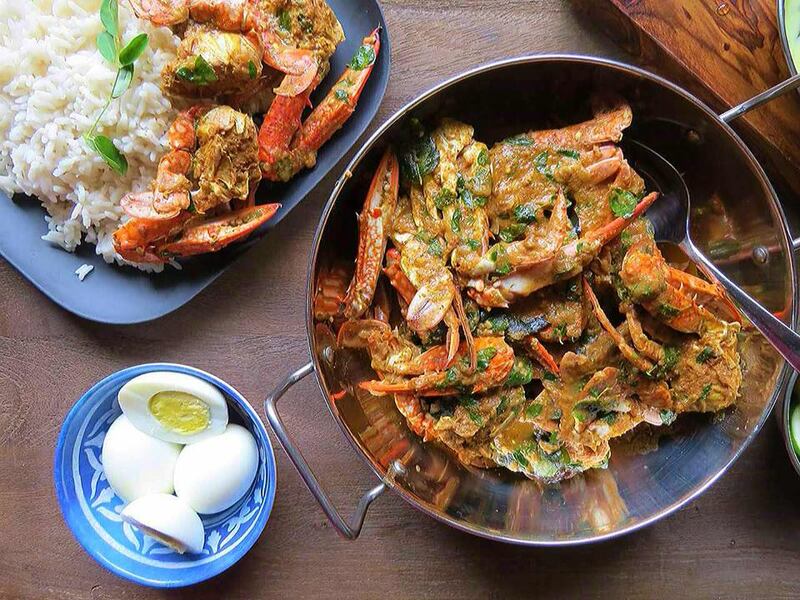 I usually serve the crab curry with rice, hard-boiled eggs, and one or two vegetarian curries such as green bean curry or mixed greens stir-fry. I love hearing from my readers. If you try out a recipe or have questions or suggestions please feel free to contact me or post a comment. I will get back to you!